Digital Leaders – Welcome to the Digitial Leaders Blog. Following our application process, we have now appointed new digital leaders. Welcome to Jayden, Ria, Kieran, Ethan, Rhiley, Michael and Jibran, who will join Madiha, Kieron, Ethan, Symran, Riley, Callum and Alfie. Keep checking our blog for more news. 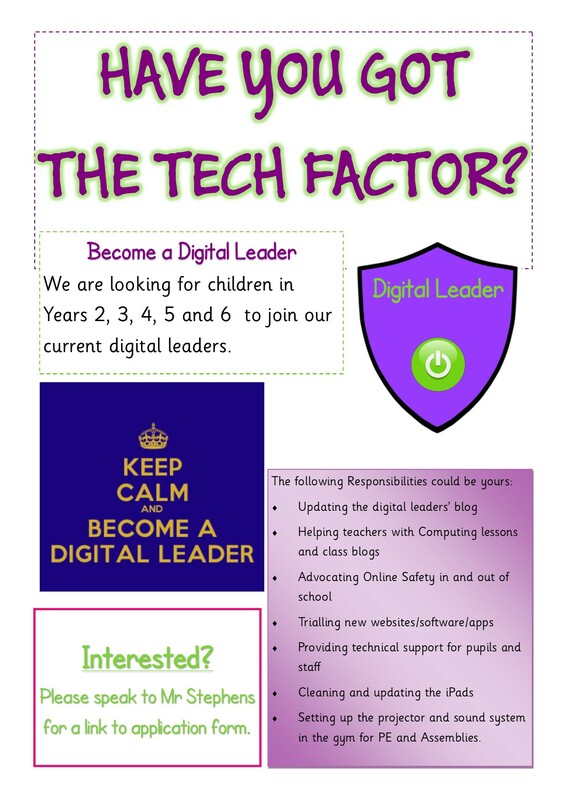 The Digital leader advert is ready to go out to classes, we are looking for some additional Digital Leaders to come and join us. Watch out for the adverts around school. We will be relaunching our Digital Leaders blog, we have not blogged in a while, but we will start to blog again soon. Keep watching for more updates. 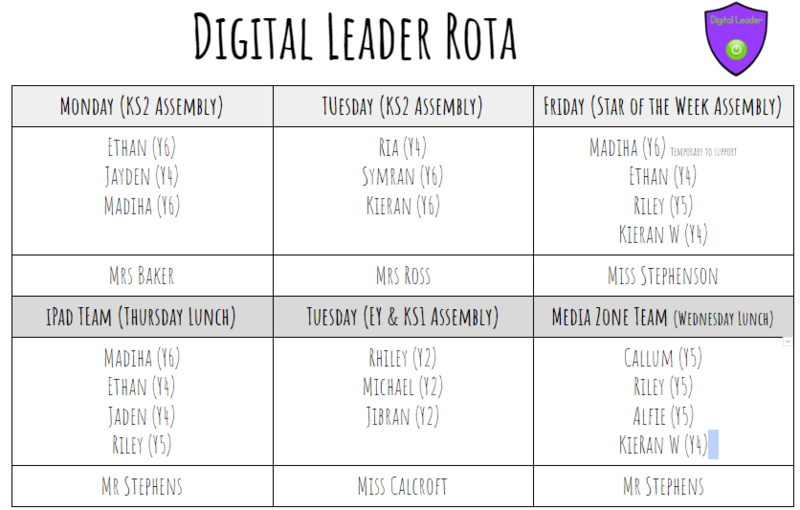 We will be holding our first full Digital Leaders meeting this week! We have welcomed Madhia, Ethan, Symran and Kieran to the team, joining Kane, Rory and Luke. Our first meeting will look at the new sound system in the gym, so we can support teachers and during assemblies. We will also look at ensuring the iPads are updated. We will be following this up with learning about Google Apps and the blog. All pupils at Rushall Primary School are in a Pupil Leadership Team. Digital Leaders are part of the Digital and Creative team. From September 2016, Mr Stephens will be advertising for pupils in KS2 to join the Digital Leaders. These Digital leaders will meet each week and carry out various tasks, they will be the digital leader support for their current Pupil leadership teams. Please keep checking the blog for the advertisement and a list of the responsibilities for Digital Leaders from September 2016. Today, in our next Pupil Leadership Team meetings we’ve edited and improved the school website. We have also disused the design for the new website. We have also started to learn about Purple Mash so we can support pupils and teachers in using it in lessons. The first meeting of 2015, was held in September. We met and discussed some of the roles that we need to undertake. It was decided that we would allocate a Digital Leader to each class to help the teacher keep their webpage up to date. We then emailed the teacher to introduce ourselves. We also allocated tasks to help out by arranging the music and projection during assemblies. At out latest meeting in June, we updated the Blue iPad set. We are working hard on keeping the school iPads up to date! At the last meeting of the Pupil Leadership Group, we were shown how to update the iPads and we cleared all photos and internet history to ensure the ipads have enough storage. At our second meeting of the Digital and Creative Leadership Team, the Digital Group, decided to create sub-groups to focus on – IT Support, Website and Music.